UPDATE: There’s an oops in the original file. I was trying to decide between two songs for the end of the show, and I forgot to delete the runner-up from the final mix. 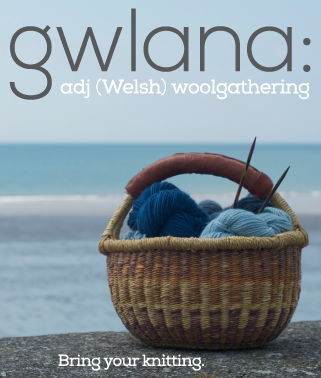 As a result Cwm Rhondda is blasting at full volume during the part of the podcast where I talk about sweaters. I’ve corrected the error, and uploaded a new track. I’ve also created a new line item in the feed for the corrected version, as replacing the file causes more problems that you could possibly know. The new version is called Episode 113: Reknitting Redo. This sounds quite a measured response as I write this, but in truth there was quite a bit of cursing and flapping about. This sort of error happens just when I think the final stages of making the podcast public all going so incredibly well. I should know by now that usually spells trouble. Huge thanks to my knitsibs for letting me know about the problem so that I could fix it! In this episode: St David’s Day heralds the return of Spring in Pembrokeshire, all of which I get to enjoy at close range due to the sudden illness of the Red Dragon. Patty Lyons drops in with a sneak peak of what’s in store studio for me at Lion Brand Yarn Studio in New York City. The yarn has arrived. Much ado about fibre, and then some musing on memory and reknitting, punctuated by music in the language of the bards. Information about Tour 2012 is HERE! 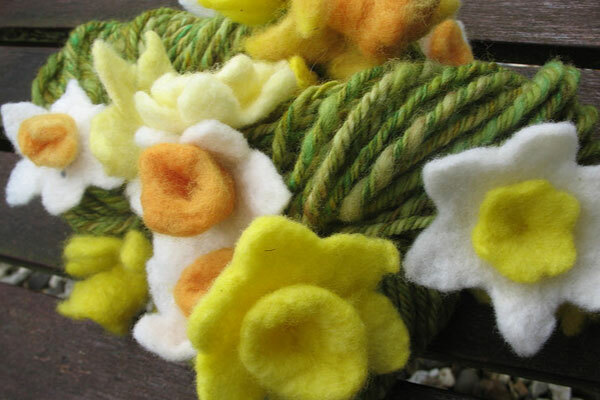 I will not be able to make the Columbia Gorge Fibre Festival but you might. Take part in the Memorable Yarn Project. Great podcast! I think you may have switched the volume levels of the end piece about the memory purse project, though–the song drowns out what you’re saying. 🙂 I hope I get to catch one of your classes at The Yarnery, and enjoy St David’s day! More synchronicity – my GPS has the Welsh flag as it’s wallpaper, and I nicknamed it “Goch”. Actually I am thrilled that the “Tour” got bumped back to May. I’ll ride my motorcycle to Chardon. Yes, I hope you are able to fix the sound volume from about minute 25 – 28. I really want to hear what you were saying, but can’t! Yes, the music drowned you out. Could you redo? I’m very fond of the hymn, “Guide me, O Thou Great Jehovah” — but not when it drowns out your discussion of a sweater. I cast my vote with the others: could you please edit from about minute 26 on to the end? And oh, how I wish I were even remotely near somewhere on your tour. Great podcast as usual! But I have a gentle correction: Shall We Knit is in Waterloo, Ontario, about an hour’s drive west of Toronto (not Kingston). I’m very excited to be taking your raglan course! Looking very much forward to meeting you! Lovely podcast as always Brenda. Is there any chance you could organise a big tour of the UK?? Great podcast, as usual. I listen to a LOT of podcasts, Brenda, but yours is just different. You seem to understand what I need to hear–your voice lowers my blood pressure, you make me smile, and you warm my heart. Thank you!! Thank you Brenda for redoing the episode. It’s interesting to learn about the art project. Hi! Thanks for another excellent podcast. Been listening since your first podcast and have very much enjoyed the ride. So glad you are going to be in California. I do hope to make it to one of the Oakland classes. Being down in LA, it’s going to take some planning. I know it would be worth it! I’ve been listening to you for about 6 months and this is my first comment (ever…on anything!). I am the daughter of a Welshman in Melbourne, Australia. We came here when I was four. Dad never hung onto Wales, but nevertheless I’ve grown up with Dylan Thomas being read out at the dinner table, Max Boyce and Welsh choirs. I’ve sung my kids to sleep with Ar Lan Y Mor and they have Welsh middle names. My mum taught me to knit as a kid and it is like breathing to me now. 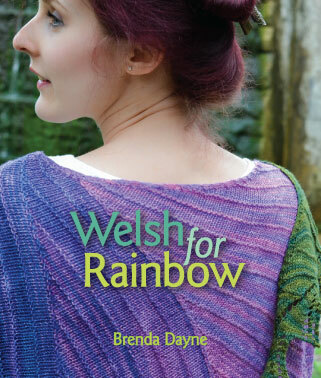 I can’t remember how I stumbled on to you now, but after hearing you talk about Dylan Thomas, your ideal home, Northern Exposure and of course the knitting, I am compelled to tell you that, Brenda Dayne, you are my kind of people. Thank you for bothering to make such an enjoyable, intelligent and provoking program. I relish it. Just signed up for classess in Chardon and I’m doing the twisted tizzie happy dance! Bon voyage! Bore da, Terrific podcast this week. I love the Welsh songs and am going to purchase the CD. My Father was born in Caernarfon 88 years ago on St David’s Day so March 1st is always memorable. I rang him in Norfolk (I am in Western Australia) to wish him a Happy Birthday. I gave him a lovely book which you may like too – Deep Country by Neil Ansell – set in mid Wales. Neil Ansell spent 5 years alone there in a semi-derelict old cottage…. Not specifically Welsh but I loved it. I am also following the fantastic Welsh Rugby Team!! I well remember going to Twickenham to see the Wales/England game back in 1966 or so!!! Such singing…. One day I hope to be able to speak the language too. The Memory project looks great I am planning mine now. Take care of your sore throat . Dioch! So glad to see that you will be at Fibre Space in Alexandria. I see a reunion is in the making. yeah!!! The pdf file for the memory purse project only partial loads and freezes up the computer. Tried again and tried just to print it without scanning down but again the process froze up the computer. Something may have happened to your file. I’m glad you are going to be at the Lion Brand Design Studio. I stopped by there for the first time last week and was delighted by the atmosphere, as well as the variety and quality of yarns. If you judge the company (harshly) by what the chain craft store buyers choose to stock, you are missing out on a source of good, inexpensive fiber. Anyway, I will always have a soft spot in my heart for their Homespun yarn. It was a gateway yarn for me. Before Homespun, I balked at paying more than a buck or two for large pile of acrylic. Once I convinced myself that paying $5 or so per skein for Homespun made sense, making the leap to $10+ per skein to feed my addiction was easy to rationalize! Love your podcast! Also loving your memory bag/memorable yarn event concept as knitting has gotten me through some serious life events. Would like to participate but cannot drop off a bag in person. Is there a way to participate anyway? As I was listening to your podcasts (I am a few weeks behind, catching up), I’d been thinking to myself how great it would be if you were to make it by one of my LYS to make an appearance. Then I thought I heard you mention Shall We Knit, and had to rewind to make sure. I then started shouting to my hubby, “Can you believe it?”. Then I went to Shall We Knit’s website to register for the memory bag workshop. Thanks so much for including Waterloo in your plans!!! I may have to sign up for the designing gloves workshop as well, since there doesn’t seem to be any Sherman socks workshops at my LYS. I look forward to meeting you in person!